Medication adherence continues to be one of the top challenges for pharmacy practice. To meet this challenge head on, pharmacists must develop better strategies to keep their patients on track with their medications. Here are just few easy ways to boost adherence in your pharmacy. 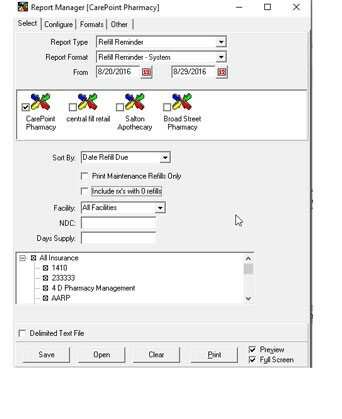 The Refill Reminder report compiles all prescriptions that are due for a refill in a specified time range. The report can be configured to run and print automatically at a specified time daily if desired. This report can be used in conjunction with our Auto Refill service, refill reminder text/email notifications, and any integrated IVR services. Sending an automated text or email is one of the easier methods to keep your customers up-to-date. Once configured, GuardianRx can generate a text or email based on set parameters letting your customers know when they are due for a refill. You can even customize the automated messages when scripts are ready for pick-up, ready to be refilled, or are past due to be refilled. For help with this feature, contact support@carepoint.com. Fusion-Rx® – Advancing patient communications. One script at a time. Fusion-Rx advances patient communications by empowering pharmacists and patients to develop meaningful, long-term relationships outside the four walls of the pharmacy. Fusion-Rx is the industry’s first patient communication solution to integrate proprietary digital, mobile and IVR technology into a single platform — eliminating the need for piecemeal communication solutions, reducing variability in messaging and improving the patient experience. Fusion-Rx allows patients to interact with your pharmacy on their terms, and provides them with a cohesive, consistent experience across every communication method that improves medication adherence. Foe more information about Fusion-Rx® or other ways you can boost adherence, contact support@carepoint.com today!